Stock # 3093, 3.6L H6 DOHC 24V, 6-Speed Manual, 97559 mi. RARE COLOR!! AIR COOLED 993 TARGA!! 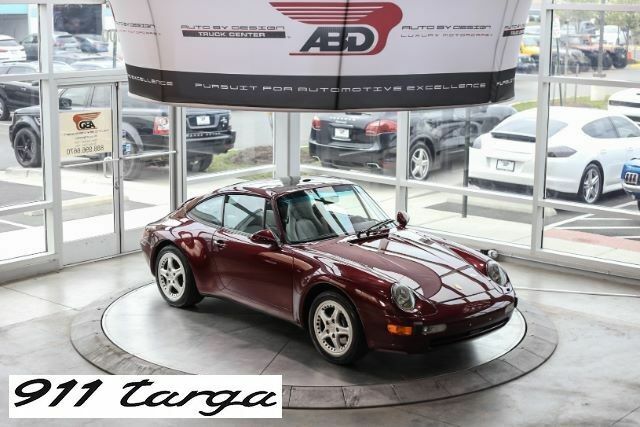 This Clean 1996 Porsche 911 Carrera Targa is featured in a Beautiful Arena Red Metallic Exterior with Premium Gray Leather. Powered by 3.6L H6 engine mated to 6 speed Manual Transmission. This 993 Targa is 1 out of only 462 Targas to make it into the US. Comes fully optioned with Premium Leather, Pano Glass, Targa Edition, Original Factory Stereo, A/C and Heat, Power Windows, Power Seats, Power Locks, Power Rear Spoiler, Dual Exhaust, 17 inch Factory Wheels wrapped in Dunlop Performance Tires! This 993 Carrera is something truly something special, with a combination of old-school feel and modern usability that isnt found in many other cars, its a relic from the time when Porsche did not cut corners anywhere! Words can not do justice to this piece of history. Very rare opportunity to own one! This 993 comes with Factory Books and Keys. ****** All of our high-end vehicles are processed through a Multi-Point Inspection to ensure that the vehicle is of the Highest Quality & Drivability, please inquire about our vehicles and ask a representative for more information. ****** This 1996 Porsche 911 Carrera Targa comes with a Clean 1-Owner Carfax Report. We offer Nationwide Shipping right to our door step and we offer Worldwide Shipping logistics as well as Financing is also available for our vehicles with rates as low as 3.79%** for well qualified buyers**. Auto loans are our specialty. We are experts in helping individuals with good and bad credit obtain a car loan for the purchase of a new or used vehicle. All of our new and used car loan services are hassle-free and there is no obligation for you to apply for a car loan today. We can help you finance your next car, truck, van, or sport utility today with our easy auto loan application.